Urban fox lives the high life. 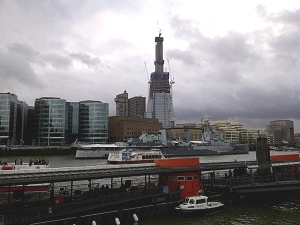 The first resident of The Shard is evicted. For two weeks, ‘Romeo’ the fox lived at the top of the Shard – the London building site where the highest building in Europe is under construction. Romeo was feeding on scraps left by the builders at a height of 945 feet (288 metres) from the ground. Following a possible 2 weeks residency, a notice to quit was served and a subsequent eviction by Pest Control Officers was carried out. He was deported to the Riverside Animal Centre in Wallington. He was released at midnight in Bermondsey, close to his original patch and Ted Burden, the centre’s founder reported that “he glanced at the Shard, and then trotted off in the other direction”. The Shard is due to be completed in Summer 2012, when it will be 1016 feet high, making it the UK’s, and the EU’s, tallest building. It will rank 45th highest in the world.